"A year after launching the successful V01, we are proud to introduce the new addition to our range, the V02. The V02 is the analogue extension of the V01 using the exact same geometry with a delicately proportioned half glass, half stainless steel front, but with a classic speedometer looking dial. The V02 uses two ‘compass needle’ hands, the short hand representing the hours and the long the minutes as on any other watch. Each hand has one red and one white end where each color corresponds to the number with the matching color on the dial. The design draws heavily on the Scandinavian design tradition using simple geometries and materials often found in architecture. 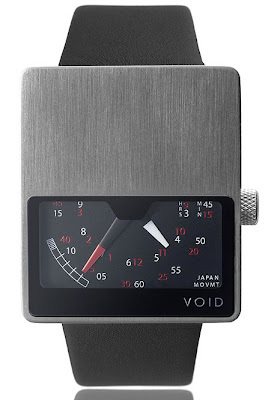 The solid stainless steel case comes in four different colors/surfaces (black, brushed, polished and gold), the watch has a mineral glass crystal and the strap is made of genuine leather. The main objective has been to create a unique product using as simple geometries as possible and bring them to life by using honest, traditional materials. The movement is made in Japan. VOID - In astronomy, voids are the empty spaces between filaments, the largest-scale structures in the Universe, that contain very few, or no, galaxies. Voids typically have a diameter of 40 to 500 million light years.